This is the English translation of a book first published in French (ETAI, 2007). 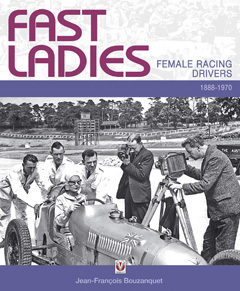 The topic of female racing drivers has been a wildly neglected one in the literature and even this book scratches only the surface by focusing only on European drivers (with two American exceptions, Dennis McCluggage and Betty Skelton) and on only 49 of them in detail. From point-to-point races to record events and rallies to Grands Prix, women were involved from the very beginning of the sport. The many, many photos, especially of the earliest days, illustrate something the text only glosses over: the sheer size of the machinery vs. the diminutive size of the drivers. People—men and women—were generally of slighter build then and if it was a feat for an athletic man to wrestle a large heavy car on skinny tires that don’t like to track straight into submission, imagine how difficult it was for a woman to muster that kind of physical strength. And strength of a different kind was required: societal pressure, gender expectations, and male chauvinism required a strong belief in one’s ambitions and inclinations. Author Bouzanquet was 56 years old when he published this book and both his age as well as his background as an amateur racer (Jaguars and Alpines in rallies and a Lotus Elite at Le Mans Classic) would have given him first-hand knowledge of the oddity factor and stereotypes assigned to female racer drivers still today by the media and also by competitors. (He also did PR for Peugeot Sport and Porsche France, worked in marketing and in the industrial sector, and collects and writes about vintage cars.) But it wasn’t an overwhelming urge to right a wrong that motivated him to write this book but the chance discovery, fittingly at Retromobile, of a shoebox full of mementos belonging to erstwhile French driver Simone des Forest, a rally driver in the 1920s and ‘30s who won the 1934 Rallye Monte Carlo with her female co-driver (both covered in this book). Their story inspired him to research the subject and three years later, voila, a book is born. With few exceptions, many of these drivers’ names have slipped into oblivion. 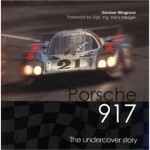 Even the reader with motorsports interests will probably make many discoveries in these pages. Told in chronological order, subdivided into decades, the book advances its story by relating the drivers’ biographies (some quite unsatisfyingly short), making reference as needed to the larger societal issues and the restrictive conditions of a male-dominated sport. Hundreds of photos illustrate the story. The vintage photos especially are a treasure trove for anything from racecars and tracks to fashion. They are very nicely reproduced, well captioned, and list the source. Since the whole purpose of the book is to introduce a little-known subject to the reader it is not helpful that the photo captions do not consistently identify people in a like manner, say left to right, with the result that in quite a few cases there is no way to match names to faces unless you already know who’s who. This is especially odd since Bouzanquet himself had just that problem when he first got his head into the research and was stymied by uncaptioned photos. How could his reader, who surely knows less, fare any better? And on that score, matters are not helped by not having an Index, a severe shortcoming in a book that breaks new ground. However, there is at least an alphabetical listing of select drivers and some of the events they drove in and cars they used. Also, the Table of Contents—cleverly printed on two adjoining pages—does list each driver by name, in her respective decade, which will require some effort to find a name but at least it’s there. There is a decent Bibliography but the foreign (i.e. non-French) titles are riddled with typos. Bouzanquet is now semi-retired and plans another book on the subject which hopefully will go even further than this worthwhile first effort. Interestingly, the same year the French version came out, the American book Fast Women, The Legendary Ladies of Racing by Todd McCarthy appeared (Miramax, 2007. ISBN-13: 978-1401352028). It has an entirely different scope and covers mainly the 1950s and ‘60s in American sports car racing.